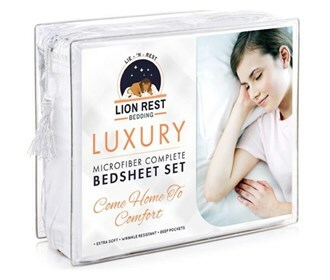 The Lion Rest Luxury Microfiber Bed Sheet Set is made of a smooth microfiber fabric. It includes pillow case(s), fitted sheet & a flat sheet. Sleep better and wake up each morning feeling refreshed and full of energy. Silky soft, most comfortable and luxurious bed sheets you can find. Best for any room in your house bedroom, guest room, kids room, RV, vacation home. The bed sheets are Fade, stain, shrink and wrinkle resistant. Machine wash in cold, Dries quick on tumble dry low, More durable than cotton. Hypoallergenic and resistant to dust mites. *(2) Pillow cases if Full, Queen, King & Cal Size is selected. Twin / Twin XL includes (1) pillow case. The Lion Rest Luxury Fitted Bed Sheet Set has many exciting features for users of all types. See the Lion Rest Luxury Fitted Bed Sheet Set gallery images above for more product views. 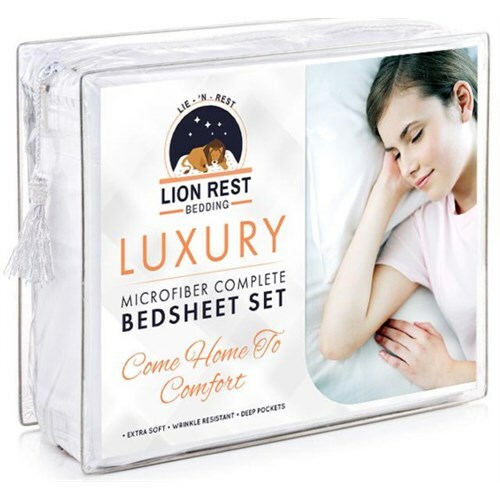 The Lion Rest Luxury Fitted Bed Sheet Set is sold as a Brand New Unopened Item.